A traditional retirement asset allocation approach will tell you much you should have in stocks versus bonds and based on that allocation you'll determine your withdrawal rate, or the amount you can reasonably expect to withdraw each year without ever running out. As an alternative, some books and advisors will recommend that instead of following an asset allocation model, you should use your money to buy a guaranteed income with an immediate annuity. New academic studies support a retirement asset allocation model that gives you the best of both worlds. Ibbotson, a company that is a leader in the investment allocation research field, has put together a white paper that concludes that you can maximize your lifetime income by replacing a portion of your bond allocation with a variable annuity that offers a guaranteed minimum withdrawal rider (GMWB). Additional research conducted by renowned academics such as Wade Pfau, Moshe Milevsky, and Michael Finke show that using other forms of annuities, such as immediate income annuities and deferred income annuities can reduce the overall cost of funding retirement. This research reflects a new way of thinking; to design a retirement asset allocation model that has the primary goal of maximizing lifetime income and reducing the risk of running out of money. This sounds like exactly what every retiree would want. So how do you create your maximum lifetime income portfolio? You start with the traditional asset allocation approach of how much should be in stocks versus bonds, and then you make some adjustments. 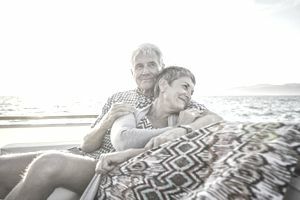 The adjustments to the allocation involve taking a portion of your portfolio and investing in a variable annuity with a guaranteed minimum withdrawal benefit, a deferred annuity with a defined payout that will begin later, or if you are retiring now, and immediate annuity which begins to pay income now. Conservative: Instead of having a portfolio that was 20 percent stocks and 80 percent bonds, you would create a portfolio that was 20 percent stocks, 60 percent bonds, and 20 percent guaranteed income from an annuity. Moderate: Instead of having a portfolio that was 40 percent stocks and 60 percent bonds, you would create a portfolio that was 40 percent stocks, 45 percent bonds, and 15 percent annuity, or to create additional guaranteed income, you would allocate 40 percent stocks, 25 percent bonds, and 35 percent guaranteed income from an annuity. Aggressive: Instead of having a portfolio that was 60 percent stocks and 40 percent bonds, you would create a portfolio that was 60 percent stocks, 30 percent bonds, and 10 percent into an annuity that would provide guaranteed income. This retirement asset allocation strategy works because it reduces the odds that you will run out of money. Also, it reduces the odds that you will have to take a decrease in income due to poor market performance. When using a variable annuity, inside of the variable annuity, you are allocating a higher percentage of stocks than you would be if you didn't use the annuity. You can feel comfortable doing so because the amount of income you can withdraw is guaranteed. When using a deferred income annuity or an immediate annuity, you know what your future income will be, regardless of the performance of the markets. You can invest other funds more aggressively knowing a portion of your income is secure. Once you've figured out how much to allocate to a product that guarantees lifetime income, you then decide how to invest the stock and bond portion of your portfolio. Here are a few ideas, with each idea getting slightly more aggressive. You could use bond ladders and buy dividend paying stocks, or use a dividend income fund for the stock allocation. You could use a retirement income fund that automatically allocates across stocks and bonds for you, and sends you a monthly check. You could layer in some high yield investments with your traditional stock/bond portfolio to maximize current income. These allocation decisions are best made after putting together a comprehensive retirement income plan. You only retire once. Working with a professional retirement expert can be useful when making important retirement allocation decisions. The shorter your life expectancy, the more you will want to choose investments and strategies that maximize current income. The longer your life expectancy, the more you will want to choose strategies that maximize lifetime income. That may mean they produce less income now, but the income would be expected to keep pace with inflation. You can change strategies to meet lifestyle needs. For example, you may want to maximize current income for your first ten years of retirement while you are healthy, with an intentional plan to take less income later when you slow down.